This week's we've got a great batch of reviews for you as well as lots of hands on reviews including the new Motorola Atrix 2 and Nokia's new Lumina 800. In full reviews, tablets are also prevalent this week - we've got the rather fine new Samsung Galaxy Tab 8.9 as well as the Asus Eee Pad Slider review. And for camera fans, there's the super new Nikon J1. Read on to check out all this week's reviews from TechRadar. Samsung's attitude to the tablet market has been to throw so much mud at the Android wall that at least some of it sticks. It's got its Android 2.3 7-incher, the wonderful 10.1-inch flagship, the beautiful forthcoming 7.7-inch model and this here 8.9-inch masterpiece. By having all bases covered elegantly, Samsung is well placed to work out where the sweet spot is and to hit it hard as the market grows. 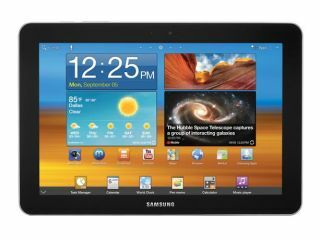 The Galaxy Tab 8.9 is essentially the same as the 10.1 only it's slightly smaller, thinner and lighter. So it's pretty good then, and perfect for you if 10.1-inches is not quite portable enough for you to be lugging around. It's been a long time coming, but the Slider really is a brilliant device. While Samsung is going for the traditional tablet look, Asus is trying something a little different. The Transformer had a brilliant keyboard dock, while the Slider has a slide-out QWERTY keyboard. It's ideal then for use on the go, and typing out emails or documents is made easier by the physical tapper. The screen is brilliant too, and Android 3.2 never looked so good on any device. A real stunner. Your only challenge now is to actually find one - stock is hard to come by at the moment, so if you see one somewhere you'd better snap it up quick! We have to say that we're really impressed with the BlackBerry Curve 9360. More so than the Bold 9900, in fact. This is the first time we've really felt that a Curve device has been given all the bells and whistles of more premium handsets, and we think the Curve 9360 will be a best seller for RIM. It's aimed squarely at those who are either on a budget and want a BlackBerry but without the size/price tag of the excellent Bold 9900, or those who are slightly younger. This is a model we can see in the clutches of many a teenager over the next few months, and with its reasonable price tag - £280 SIM-free or free on a £25 per month contract - it's likely to fit that mould perfectly. Toshiba's first real stab at introducing some of its CEVO processing power into its UK TVs isn't without its flaws, but it's still a very nice TV overall. While there's a nagging sense that Toshiba could perhaps have used its CEVO Engine processing a bit more overtly in the 55WL863, it's still the case that the system has helped Toshiba deliver a really good TV that deserves a place at the top table of TV quality this year.